To make sure our products are of exceptionally high quality, we use a refined SPA* (Specialty store retailer of Private label Apparel) business model. This allows us to control the entire process — from planning and design, to material procurement and sales. Our management policy and approach to doing business are unique and innovative -- just like our clothes. 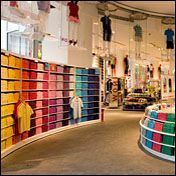 Explore financial reports and highlights of UNIQLO and our parent company, Fast Retailing.